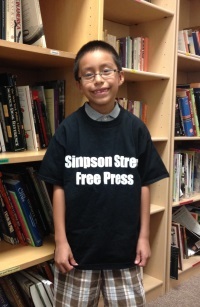 Simpson Street Free Press Hires 7-year-old Samy Garduño to Write in Both English and Spanish. At just seven-years-old and only in the second grade Samuel Garduño- Martinez, otherwise known as Samy, is the youngest staff writer in the history of Simpson Street Free Press. Samy began working at Simpson Street this fall. His older sister, Nancy, was a student reporter at Simpson Street for several years. She now attends Edgewood College. So, the Simpson Street staff has watched Samy grow up right before their eyes. In the past, SSFP has only hired students starting in third grade. But, Samy was an exception. Although Samy is surrounded by older youth and adults, he does not feel intimidated because there is a comfort in working with family members and friends. His cousin, Gloria Gonzalez, is an editor at the Free Press and herself a former student. No doubt there is definitely a certain level of maturity and responsibility required to hold a job, and there are not many second graders who can operate at that level. The Simpson Street staff say Samy demonstrates outstanding work ethic, not only apparent at work, but also at school. A student at Glendale Elementary School, Samy’s favorite subjects include math and art. He likes math because he is one of the few, if not the only child in his class, who knows how to multiply. Art is also one of Samy’s passions; he especially loves to use watercolor paints. Not surprisingly, he aspires to be an artist when he grows up. With regards to reading and writing, Samy is advanced to put it quite simply. At school, Samy reads at a fourth grade level and has been reading chapter books since kindergarten. In fact, Samy likes to create his own stories. Keeping in mind Samy’s young age, it makes sense that his absolute favorite thing at school is “free choice”– time set-aside for students to choose their activities. Usually, Samy spends “free choice” using the building blocks to build and demolish his towers. At home, Samy spends the majority of his free time with his three-year-old brother, Daniel. Because he is busy with school and family, Samy is rarely able to use a computer. For this reason, Samy loves being able to use the computers available to students at Simpson Street Free Press. This is just one of the many opportunities that have become available to Samy since becoming a staff member at Simpson Street. Samy Garduño will produce written work for two of Simpson Street’s publications, Glendale Free Press and La Prense Libre de Simpson Street. You can read his articles at www.simpsonstreetfreepress.org.